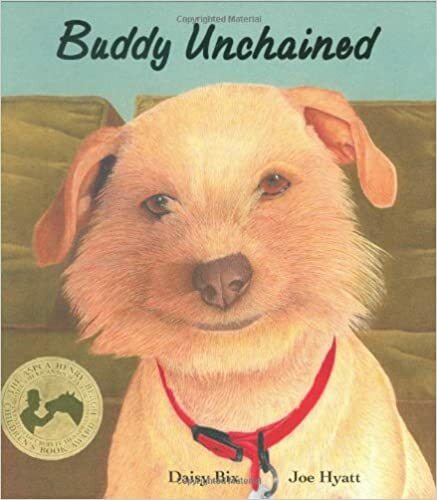 A few days ago I read a book called “Buddy Unchained” to some children. This book is part of the Readers program. It is about a dog that was ignored by his family. He was left outside on a chain in the cold and in the rain. He wasn’t fed or given fresh water everyday. Children threw rocks at him and because he was on a chain he could not escape or protect himself. This dog is so neglected and finally one day collapses in the snow. A man takes the chain off of him and carries him to a shelter where they warm him up, clean him, feed him, and get him ready for adoption. A family does comes to adopt him and they name him “Buddy.” Buddy is brought INTO his new home where they play with him, cuddle with him, take him for walks, and tell him he is a good boy. Again, I asked the children questions about how they think Buddy feels by looking at his body language and what is happening in the picture. But hey, who are we kidding? We adults think those very same things, right?! I encourage you to consider purchasing this book for the children in your life, whether they are grandchildren, nieces, nephews, godchildren, neighbors, or your own. We all have children in our life. Children are the future for animals, we need to teach them empathy towards them which also helps them learn empathy in general. This book is available on Amazon. You can see the entire book here. The tale about Buddy does have a happy ending. But there are many dogs, like Buddy, still waiting and need our help. Yowzah! That’s a tough question! From the picture in the story, it looks like the guy is wearing possibly a uniform. But if the dog belonged to another family and if they hadn’t been warned, and if it wasn’t a humane organization or the police that took him, then yes, maybe technically, he would be considered stolen. But there needs to be more laws protecting animals! It should not be considered “stealing” an animal when they are neglected or abused. It is rescuing, is it not? We can’t be expected to sit by and watch a living creature suffer, or worse, die. Unchain Your Dog is a helpful website that has a list called 18 Ways to Help a Chained Dog among other great resources including how we can help pass new laws. Yes, I agree with you. I think, there can be several reasons for the missing Likes. Many today are so busy and don’t use much time for either reading for their kids or have pets/animals at all, because they have other priorities in life. I find this sad too, both are teaching kids in great ways of life. It is sad. Not taking the time to teach kids important life things is going to have consequences, as we are even seeing now. It seems we are so concerned with how educated someone is so they can make a lot of money, instead of being concerned with things like empathy and kindness.